October in the Cotswolds is a magical time and our private lake offers 8 secluded log cabins, all located on the water’s edge with the most spectacular panoramic views. The thousands of trees surrounding the lake take their autumn colours and our luxury holiday lodges provide the perfect cosy lookout point for couples, families or groups. Our lakeside holidays in October are all about long walks in the reserve and getting toasty around the wood burner or fire pit. And of course we haven’t forgotten all the little luxuries, because every cabin at Log House Holidays comes with a private hot tub overlooking the water and we can even help you arrange a 5 star luxury spa session in the privacy of your lodge – perfect for cosy girly weekends in the Cotswolds. The autumn colour was spectacular once again this year. My partner and I love coming back each year for our secluded weekend. We highly recommend a few special days away at this unique place. 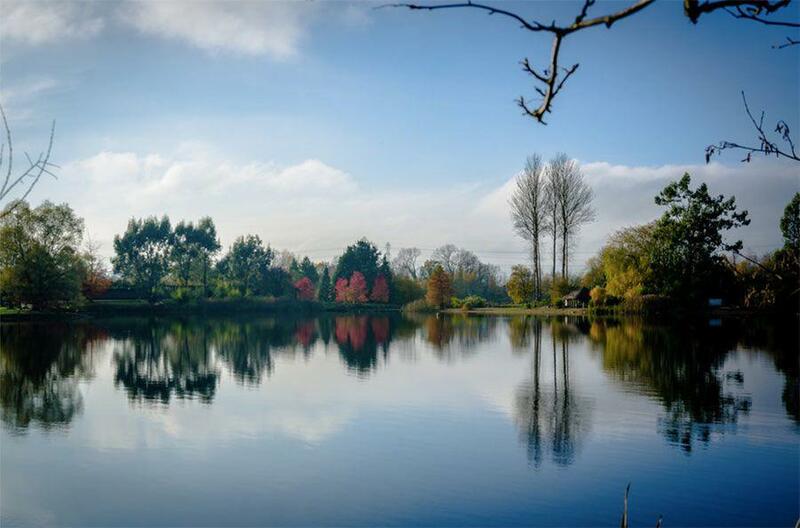 Capture the autumn colour reflections around the lake with a photography lake holiday on our beautiful reserve. Our 130 acre nature site makes for the perfect playground for those who love photography, especially in October. Not only for the amazing colours and misty mornings as the summer heat disperses from the lake, but also for the rare birds that can be captured at this time of year. We can help you arrange a group or one-to-one photography class with a local master so remember to bring your camera and tripod. Or if you just want to admire the wonderful nature, use the binoculars in your cabin to spot wildlife around the lake. If you’re lucky, you might see bittern or osprey stopping by, or you might even spot the local otter family splashing around in the water. Get the kids out of the house and take them on an exciting and stimulating holiday where life’s simple pleasures fill the day. Explore the 2.5 mile lake walk each morning with the crunch of autumn leaves beneath your feet or let them take the boat out in the afternoon to enjoy a real ‘Swallows and Amazons’ experience, exploring the many islands around the lake or try some fishing. 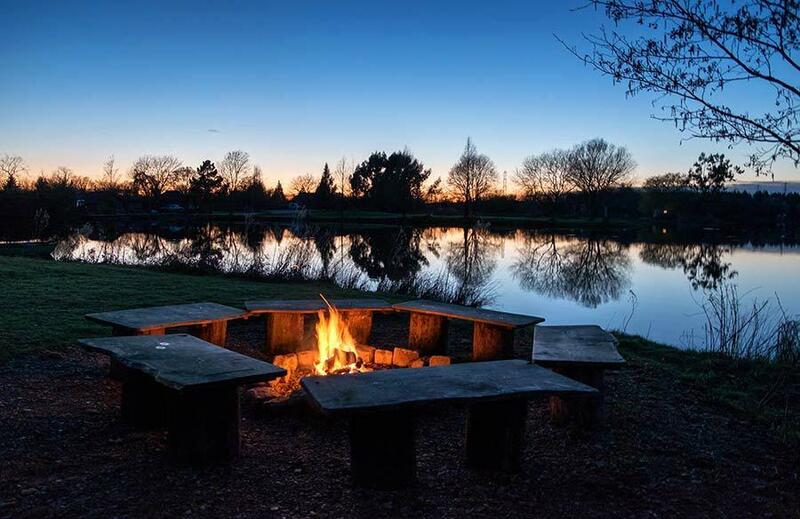 Unwind in the hot tub together as the sun sets on the colourful lakeside banks then finish the day lighting the fire in the outdoor fire pit for toasting a marshmallow or two. Days like these will never be forgotten and both you and the kids will get back to term time feeling refreshed and re-energised. October is one of the most scenic and romantic times to visit our lake. And it’s also a great time to explore the local Cotswolds area. Local produce is abundant in October so you can pick up some fantastic ingredients for your self-catering holiday back at our luxury log cabins. For a day out walking, head to one of the many arboretums or National Trust properties in the Cotswolds, such as Westonbirt Arboretum. For fine dining or delicious pub grub, just be sure to check out our Cotswold Guide and Blog for top recommendations. Also not to be missed is the Cheltenham Literature Festival, a 10 day celebration of authors, guest speakers and literary legends as well as politicians, comedians and stars of the stage and screen. For all book lovers, the biggest names in fiction, politics, television, art, food and sport will all be there.